SAP ABAP Blog Covers Dictionary,reports,OOPS,BDC,Scripts,Forms,EDI,ALE,IDoc,BAPI,BADI,MySAP,ERP,CRM,FICO,BIW and Interview Questions. SAP Controlling has actual posting where the data is posted and this is the continuation of that post.For assigning processes that do not relate to product, but relate to profitability segments, the template is linked to CO-PA characteristics.Process driver information might be available already e.g. in CO-PA or the LIS. In many service industries process driver data is held in external systems. Functions can be custom-made to calculate with them. 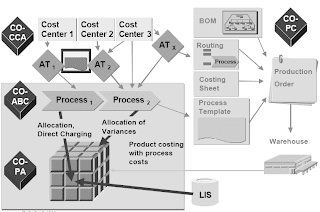 For assigning processes that do not relate to product, but relate to profitability segments, it is also possible to use allocations as well as process templates.There are two methods that can be used to allocate processes to CO-PA.The first method is a direct internal activity allocation, This method is available for actual allocations only and can't be used for plan allocations.The second method of allocating processes to profitability segments is assessment.LIS key figures can be transferred to CO-PA to serve as tracing factors for the actual assessment.The CO-PA record type of “H” has been created for the transfer of LIS key figures to CO-PA. New value fields are needed in CO-PA for the key figures. 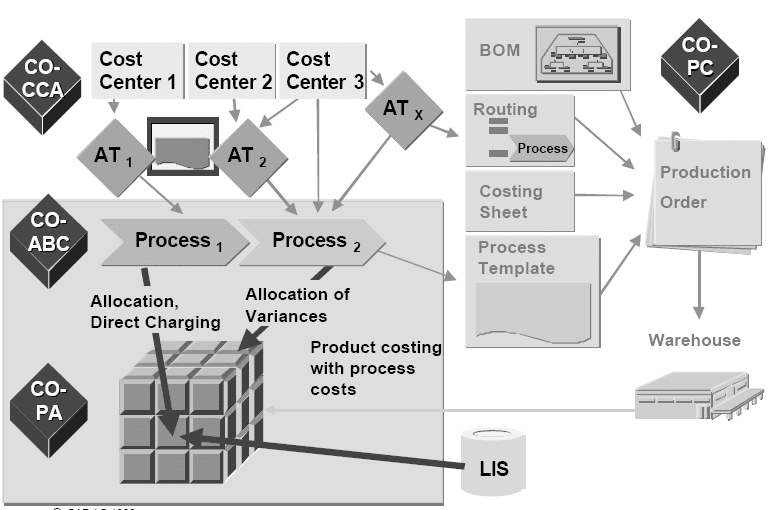 Because a process is a controlling object in Integrated ABC and will contain both planned and actual costs, variances will naturally occur on a process as they do on cost centers.Complete variance analysis, consistent with the variance analysis traditionally available for cost centers, is available to use on processes to answer the inevitable questions on process management and the differences in actual resource utilization from planned utilization.The same variance categories are used for process variance analysis as are used for cost center variance analysis.